We’d love your help. Let us know what’s wrong with this preview of Don't Get Scrooged by Richard Carlson. To ask other readers questions about Don't Get Scrooged, please sign up. Overall an enjoyable book but seems to be mostly common sense and not anything particularly deeply insightful. Not Richard Carlson's best book but just an okay reminder about how to deal with difficult people. 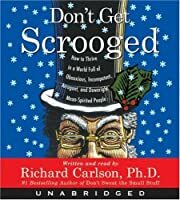 Even though Don't Get Scrooged by Richard Carlson, Ph.D. is intended for the upcoming holidays, I simply couldn't wait to pick it up. I felt it was pertinent to me, even now, in that our country and community is in a constant state of agitation. Truly, I can't go a day without running into a 'Scrooge' or being one myself. 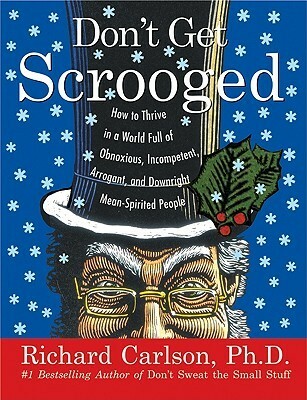 I figured that the size of this book would make it a simple read; however, I didn't anticipate the amount of applicable information that would present itself in such a tiny pac Even though Don't Get Scrooged by Richard Carlson, Ph.D. is intended for the upcoming holidays, I simply couldn't wait to pick it up. I felt it was pertinent to me, even now, in that our country and community is in a constant state of agitation. Truly, I can't go a day without running into a 'Scrooge' or being one myself. I figured that the size of this book would make it a simple read; however, I didn't anticipate the amount of applicable information that would present itself in such a tiny package. I found myself laughing out loud while conducting some serious introspection at the same time. And, the theme boils down to simply a matter of choice - how we choose to respond to a situation, internalize the actions or words of others, and ultimately whether or not we let go of a feeling, or even a person. Carlson does a phenomenal job of encouraging the reader to relate to every topic - I'm sure that everyone has met an obnoxious person once or twice in their life, and thus, the material is easy to grasp as well as take action on. I picked up this book mainly for the tag line - "How to Thrive in a World Full of Obnoxious, Incompetent, Arrogant and Downright Mean-Spirited People". Obviously, I struggle with thriving - I tend to cower, fear and even oblige only to sulk and stew later on. My deeper issue is why I don't have the confidence to simply stand up for myself, rather than allow myself to be walked on. Perhaps, it is due to my dislike of conflict; however, as so cleverly stated in this book, avoiding or ridding one's life of conflict is unrealistic, and therefore, we must fully prepare and learn how best to deal with it (and those who bring it on) as well as try to limit our own opportunities by which we bring that same conflict into the lives of others. Conflict in its own right can be good - it can help us to change (I experienced that feeling of anxiety, fear, and nervousness today and thanked God for the opportunity to feel such emotions again, even though I wish to avoid them entirely) particularly when change is difficult but necessary, it can also bring light into our lives of who we are and how to become our best self, not to mention driving us into the path of the unknown only to realize we will come out 'ok' and unscathed. This book focuses on the simple steps (albeit not simple in the initial moment, but in the hindsight), and challenges its reader to simply 'do it'. #1 We choose how to respond, deal and approach/avoid conflict whether with others or a situation. Thus, make your choice wisely. #2 People are people, we all have bad days, moments, minutes and it helps us to keep that at the forefront of our responses. #3 Communicate clearly how you wish to be treated, or you will be forced to deal with alternative treatment. #4 DO NOT allow people to dictate your actions or choices through guilt, and be willing to accept their response. If you allow your life to be run by others, accept it and don't complain about it. I'd say that this is something I still struggle with - I allow people to 'guilt' me into (or I guilt myself into) helping other people, only to feel as if my time was disrespected, unnoticed, or unappreciated. I tend to complain rather than acknowledging my own role - I should have the courage to stand up and speak out rather than 'sulk and stew'. #5 Just because family is FAMILY, does not mean that we should allow them to run our lives. All in all, this book has proved to be a terrific (simple, objective and still profound) tool for me to better understand myself and my responses to those who are not like me. As well, it held me accountable to my own choices and actions, understanding that my poor attitude, quick snap or response, and my choices affect the lives of others. In addition, choosing to move forward and beyond from a situation is also my choice, and in choosing to do so (or not) affects others as well. Get something better to talk about... or even better, get a life. Great read. I will probably pick this one up again - closer to the holidays. "People who rarely get scrooged seem to b the ones who make it clear to others, through their words and actions, what they will and will not tolerate... These people say and show, 'I will put up with this but not with that.' They set fair, clear, consistent boundaries, stick to them, and don't feel bad or guilt about doing so... They set limits and stand by them." This is not as much a work analyzing Charles Dickens' classic novel, A CHRISTMAS CAROL, as it is a friendly warning and ultimate indictment of those people in your life who resemble the central character of Ebenezer Scrooge. 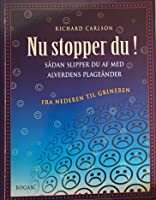 Carlson is the world-famous author who wrote DON'T SWEAT THE SMALL STUFF and this work will definitely help those who look on the brighter side of life that are forced to deal with the angry rabble (that sometimes appears to be the majority) who make up the rest of the world. Mostly common sense, especially to people who already know how to selfreflect on life. It had a few good points that I could add to my mindset, but nothing ground-breaking. Bah! Humbug! This is just "Small Stuff" reworked to exploit the holiday market. There are some pieces in this book I am glad to see. The practice of "Sing Your Way to Happiness" definitely works. I was once standing at a transit station with girlfriend. It was cold, and near Christmas. Folks were grumbling because the bus was late. As we waited, I sang "Do You Hear What I Hear" for my girlfriend. I sang gently because we were standing close to stay warm, yet others seemed to hear me. The song changed the attitude of people waiting, and one person even said thank you for the There are some pieces in this book I am glad to see. The practice of "Sing Your Way to Happiness" definitely works. I was once standing at a transit station with girlfriend. It was cold, and near Christmas. Folks were grumbling because the bus was late. As we waited, I sang "Do You Hear What I Hear" for my girlfriend. I sang gently because we were standing close to stay warm, yet others seemed to hear me. The song changed the attitude of people waiting, and one person even said thank you for the song. Even with the good bits, this book is not what was expected at all. From "Don't Sweat The Small Stuff," Dr. Carlson seems have to gone all the way to "Step aside and allow nasty people to have their way." In one story, Dr. Carlson allows someone to jump ahead in line. When the staff person tries to set things right, Dr. Carlson stifles the staff person's efforts by deliberately tacking the other tack. He allows the bully to jump the line. Indeed, Dr. Carlson acknowledges "Some would say that this was weak of me, or that I taught the bully he could get away with bullying, or even that I'd done wrong by lying. "Fine. What I know is that I prevented a two-way - and possibly three-way - fist fight." It seems Dr. Carlson has forgotten a simple truth. All that is required for evil to prevail is for good men to do nothing. Instead, he allowed his fear to rule so thoroughly that Dr. Carlson claims the ability to see the future as justification for his actions. Yet Dr. Carlson is not satisfied with doing nothing. He put a good man down by stifling the effort of the staff person to make things right. He did, indeed, lie. He showed the bully not only that bullying is acceptable, but that Dr. Carlson wholeheartedly supports bullies. Wasn't quite what I expected. I found an okay read. More entertaining that really a self-help book. vignettes seemed to be based on the Golden Rule philosophy and turning the other cheek. 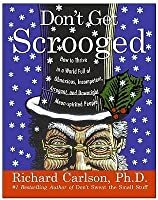 No real concrete advice on how to reduce the shock of dealing with a Scrooge or Turkey as Richard Carlson refers to these obnoxious, incompetent, arrogant and down-right spirited people. Good book to read while waiting in an airport for a delayed flight. I was expecting more from it. the book seemed to be pretty much saying 'turn the other cheek' but really didn't give much advise as to how one might do that ... count to 10 and meditate are not all that new or creative suggestions, definately not suggestions that make it worth reading the book ... and i am not too sure how someone who is not religious at all could use his 'god box' suggestion. Marketed carefully as a book to help you deal with difficult people, the book information often FAILS to point out it really is just one of those “chicken soup for the whatever soul” twaddles, but this time aimed at making sure you don’t become Mister or Miss Grumpypants for Christmas. I finished it… barely. You’ve now been warned. This book was great. Richard Carlson gives lots of great tips and advice on how to deal with simple every day problems. I would recommend this book to anyone who wants to remove stress from their lives. Although this book has a holiday theme to it, the ideas presented here are applicable to all life situations any time of the year. Richard Carlson, known for his "Don't Sweat the Small Stuff" series, once again provides insight and advice on dealing with difficult people. Highly recommend! A quick guide to prepare us for dealing with people (just like ourselves) who aren't perfect all the time. Richard Carlson, Ph.D, was born and raised in the Bay Area. He grew up in Piedmont and received his bachelor's degree from Pepperdine University and his doctorate in psychology from Sierra University before opening a private psychotherapy practice. During his life, he was considered one of the foremost experts in happiness and stress reduction in the United States and around the world and was a fre Richard Carlson, Ph.D, was born and raised in the Bay Area. He grew up in Piedmont and received his bachelor's degree from Pepperdine University and his doctorate in psychology from Sierra University before opening a private psychotherapy practice. During his life, he was considered one of the foremost experts in happiness and stress reduction in the United States and around the world and was a frequent featured guest on such shows as Oprah, The Today Show, The View, NNC, CNN, Fox, PBS, and more than 200 other shows. Don't Sweat the Small Stuff continued to be a publishing phenomenon with more than 20 titles in the brand franchise, two of which were co-authored and authored with his beloved wife, Kris. The words "don't sweat the small stuff" have become a part of American culture thanks to Richard Carlson's book, which became a runaway bestseller and made publishing history as the #1 best-selling book in the United States for two consecutive years. The book spent more than 100 weeks on the New York Times Best-Seller list and is still considered one of the fastest selling books of all time and has sold more than 15 million copies worldwide.